Handbook of Dental Pharmacology and Therapeutics is a supplement to lectures given in dental schools on the subject of pharmacology in dental practice. 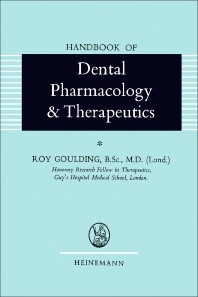 The author describes dental therapeutics and pharmacology including the prescription of drugs, legislation of dangerous drugs, posology (dosage), weights and measures, frequency, or administration. He explains the sedatives, hypnotics, and anticonvulsants: he notes that narcotics can depress (not uniformly) all the tissue in the human body. The author also describes the mode of action and the stages induced in general anesthesia; the classification, action, and the therapeutics of analgesics (antipyretics, opiates, synthetic opiates). An interesting subject concerns analeptics or restoratives to resurrect the dying that includes stimulants of the central nervous systems (ephedrine, amphetamine, strychnine). Visits to the dentists should include obtundents and counter-irritants that dull sensation to pain. The author notes that in drilling cavities, the sharper the bur, the less obtundent needed. The author also addresses other drugs (hemostatic, anticoagulants) and those acting on the cardiovascular system or on the blood vessels. This handbook can prove useful for dentists, dental aides, pharmacologists, practitioners of general medicine, as well as students of dental medicine.